This is my updated review of the British Airways American Express Premium Plus credit card (BA Premium Plus Amex). The British Airways American Express Premium Plus card is issued directly by American Express. You can hold up to 2 charge cards and 2 credit cards which have been issued by American Express at any one time, although this doesn’t include Amex cards which are provided by the likes of Lloyds, TSB or Barclays. I’d recommend checking your credit rating before applying for a new card. Generally you should have a rating in excess of 700+. Click here for a free Equifax credit report and score. It’s free for the first 30 days and then £14.95 per month afterwards (make sure you cancel in the first 30 days!). 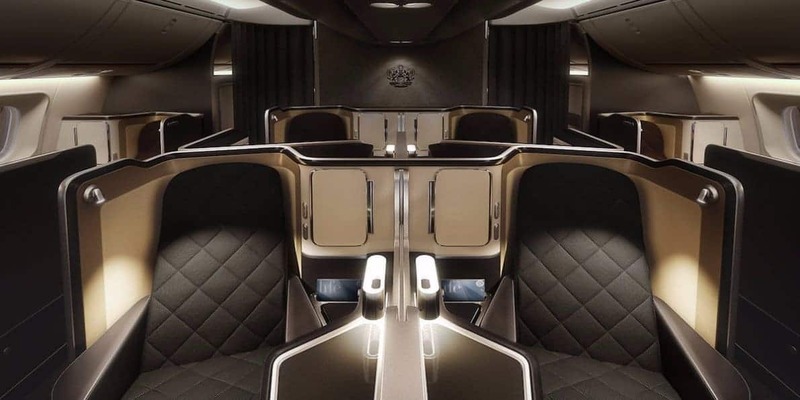 The annual fee for the BA Amex Premium Plus card is £195 – don’t let this put you off, read on to find out why I believe this is one of the best cards on the market. What are the Other Benefits of the British Airways American Express Premium Plus Card? Anything Else I Should Know About the BA Amex Premium Plus? 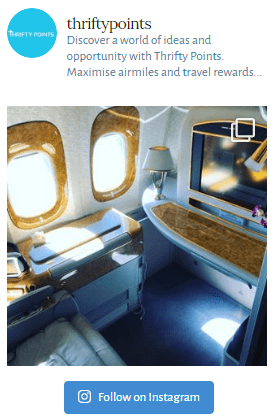 Ways to Spend Your BA Premium Plus Avios Points? The British Airways American Express Premium Plus credit card offers 25,000 Avios points when you spend £3,000 in your first 3 months. This can be increased to 26,000 by using this link and scrolling down to the correct card. Membership reward points can be directly converted to Avios and with a number of other partners. One of the most enticing elements of this card is the 2-4-1 BA voucher when you spend £10,000. This allows you to book two Avios redemption flights for the miles of one and is extremely valuable if used for long-haul Business redemptions. If you were to use these for 2 Club World flights to say Barbados on a peak day, this would save you 150,000 Avios points. That could be you at the Sandy Lane Hotel Barbados below. Earn 1.5 Avios point for virtually every £1 spent on the card. These can be applied to the 26,000 sign-up bonus and will help you reach those further-away destinations. You receive double Avios (3 per £1) when you book flights or holidays directly through British Airways – click here to see current deals. American Express no longer has a minimum income requirement for the British Airways American Express Premium Plus card. Recent changes to American Express rules now mean that to qualify for the sign up bonus you cannot have held a BA American Express credit card in the last 24 months (either the free of premium). You can still obtain the sign up bonus if you’ve had any of the other personal cards – learn more about the sign up bonus restrictions and our suggested strategy here. If you’ve read some of the other articles on Thrifty Points, you may be aware that I think the British Airways Premium Plus credit card offers one of the best credit card rewards on the market. In fact I’ve just returned from a First-Class trip to Brazil which wouldn’t have been possible if it wasn’t for the BA Amex Premium Plus card. 12 hours being wined and dined in the seat below was amazing – not to mention my unforgettable visit to the Heathrow Concorde lounge. 25,000 Avios points as standard when you spend £3,000 in the first 3 months. If you use this link you’ll earn 26,000 Avios points. 1.5 Avios points for every mile you spend. 2-4-1 Voucher when you spend £10,000 on the card in a year. Fred – has recently left university and has begun working as a graduate in Bristol. Fred will spend an average of £750 per month on the British Airways Premium credit card. Fred likes to travel although tends to travel solo in economy. On the basis that Fred will only spend £2,150 in the first three months he unfortunately won’t receive the 25,000 sign-up bonus. Click here to read my post about the value of Avios. At approximately 1p per Avios this could have been worth somewhere in the region of £250 and would have definitely offset the annual cost of the BA Premium Plus Amex card. Furthermore Fred will not spend enough to gain the 2-4-1 voucher, again another opportunity missed. However as Fred tends to travel solo the voucher may be somewhat difficult to use. Finally Fred would have earned 13,500 Avios using the card for his everyday spend. Again at 1p per Avios this would equate to £135 and would not offset the cost of the card. James – Has a partner and no children. He spends approximately £1,400 per month on his credit card. James tends to travel with his partner. If James had no Avios when he signed up to the card, by the end of the first year he would have a total of 25,000 + 25,200 = 50,200 Avios points. If he was to use the 2-4-1 voucher for a flight where the ticket price was 50,000 per person, he’d be able to save 50,000 Avios or £500. Not bad. In the example above Fred would be far better off signing up to the free (for 12 month) American Express Gold card, where he’d be able to hit the £2,000 spending threshold to unlock 20,000 Avios points (or 22,000 if you use this link). On the other hand, the benefits James accrued have racked up to approximately £2,500 which more than offsets the £195 pa fee. A no-brainer in my eyes. There are no other cards currently on the market in the UK which would offer James the benefits of the British Airways Premium Plus credit card. Hotel accommodation: The Avios website has an extensive selection of hotels which can be booked using Avios points. 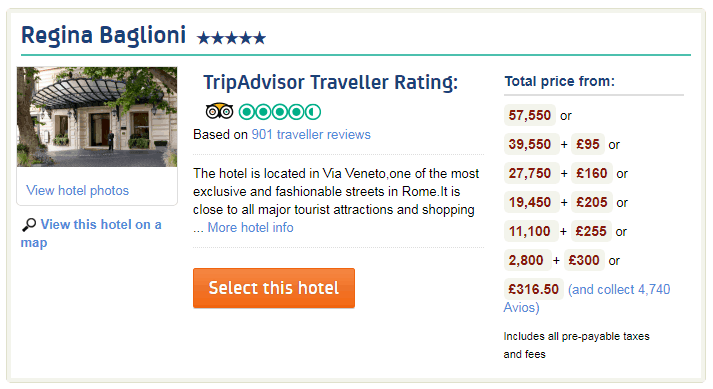 The value varies depending on the brand, however if we take a look at the Regina Baglioni in Rome, if we were to book using Avios it would require 57,550 verses £316.50 if booked by cash. That values an Avios point at 0.55p. Wine, beer, spirits: A bottle of Kew Organic Gin would require 7,000 Avios points and could be purchased from Amazon at £20.69 (as seen here). This would provide poor value at 0.3p per Avios point. Experience days: A trip to the Tower of London would usually cost £22.70 if booked online. Adult passes are available at 4,500 Avios points, equating to 0.5p per Avios point. Car hire: Car hire represents reasonable value for money. A small car next week would break back to about 0.55p per Avios. As previously mentioned, I believe that the most efficient use of Avios points is for flights. Take a look at my review covering the value of Avios points found here, where Avios points can be worth anywhere between 0.8-1.5p per point – a significant increase on any of the options above. You may also find some of the tips within the article useful to make your Avios points go further and avoid high airline taxes. Worth considering once you’ve earned a considerable number of Avios with the BA Premium Plus credit card. The sign-up bonus of 25,000 air miles is a big bonus for this card (26,000 air miles if you use this link and scroll down to the correct card), however the biggest benefit lies in the redemption of the 2-4-1 voucher. To obtain the voucher £10,000 must be spent in the first anniversary year of the card. The card also has a higher than average earnings bonus, with 1.5 miles per £1 spent. If you are unable to spend the £10,000 each year on the card, I’d suggest that the free (for 12 months) American Express Gold Card is better (find my review here). However for the larger spenders this card offers great value for money …in fact the best value for money. I’ve recently booked two return First-Class tickets from London to Sao Paulo using my 2-4-1 voucher. Watch this space for a full review coming shortly! I hope you’ve found the British Airways American Express Premium Plus card review useful and as always please do comment if you have any queries. Please share this post if you think friends would be interested. 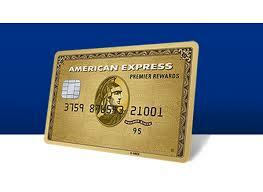 A link to the application form for the BA Premium Plus Amex card can be found here.